WHEN YOU GO HOME , TELL THEM OF US AND SAY, THAT FOR YOUR TOMORROW , WE GAVE OUR TODAY . It was a disaster of epic proportions, magnitude unimaginable..destruction, death, debris everywhere. When the call for help rose in voice, out came the unsung heroes- the INDIAN ARMY, AIRFORCE, ITBP, NDRM. The guys who never took centerstage but quietly did what they do best- SAVING LIVES. Using their training, equipment, tactics, machines they set about their task, untitiringly . Unfazed by the politics going all around, they just did their work...no questions asked, saving each life in a terrain seeming inhospitable and tough when mother nature seemed to wreck total havoc all around. Making use of every available inch of solid ground and ration available , they fight through adverse weather conditions where the only stopping force is their mind- which has taken a backseat since the rescue ops began. I put forward stories and incidents of these brave men and woman who go beyond the call of duty. Stories of grit,courage, honour and supreme sacrifice. "Our helicopter rotors will not stop churning till such time that we get each one of you. 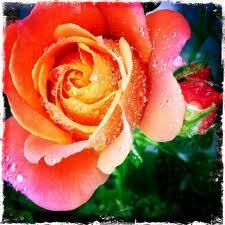 Hang in there, don't lose hope." "यह काम हमारे घर का है , ड्यूटी का नहीं ," an Indo-Tibetan Border Police jawan, who hails from Kumaon region, said. 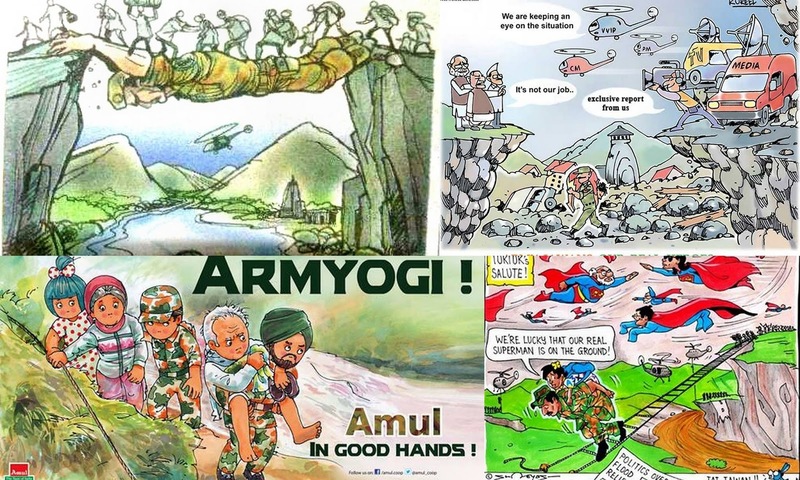 Senior officials of the border guarding force, are witnessing unusual show of character by their troops in the face of tough adversity caused by heavy rains and flash floods in the state. "Many troops have refused to go on leave. Those on leave came back after the tragedy broke out. We can understand their emotions", Commanding Officer of the 8th ITBP battalion G S Chauhan. Sometimes, I have to stop them from working and have to persuade to rest and recuperate. They take this work as their personal task. ITBP jawan Chet Lal refuses to go back home as he rushes to catch a helicopter flying from Gauchar after gathering food, water and medicines for people who are trapped in Jangalchhati. "Why would I get tired? It's sad to see what is happening to my people here. I never thought I would one day be a small part of those men in uniform who are now providing succour to the needy. But I am happy and proud that I am doing what I am doing,"
For the ITBP Assistant Commandant Jag Mohan, a high fever and hospitalisation were no deterrents to join his men involved in the rescue tasks since June 18. "I asked my commanding officer thrice to let me join duty but he kept refusing, keeping in mind my health. I finally took a motorcycle from Chamoli and joined my unit," Mohan said. He is now commanding a small unit of ITBP men which has been placed at the joint forces helipad here for receiving and helping rescued people who are de-boarded from choppers. CO Chauhan understands his men very closely. "When I tell someone to proceed on leave and that he would be suitably replaced by another jawan, they make a humble submission to which I have no reply," Chauhan said. The boys say " साहब छुट्टी लिखित में ले लो पर मुझे यहीं रखो" the CO said, adding, "Hence, I have stopped fighting with them." Among the Air Force heroes who are ferrying hundreds of people to safety in Uttarakhand every day, are two couples. 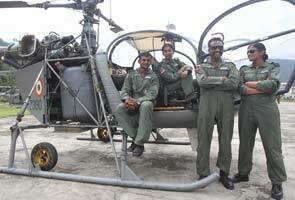 The husbands are operating the large Mi-17 choppers, and the wives pilot 'Cheetahs' . "We have the most important vow to keep with the Indian Air Force. We never thought we would be together on this mission,"
Squadron Leader Pradhan told as his wife readied for a sortie to Rudraprayag. Squadron Leader Thiagaraman said he just wishes his better half good luck as he knows she is a top notch pilot. 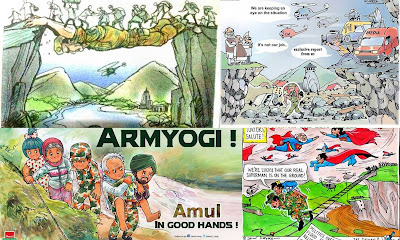 On June 17, Yunus landed at Dehradun's Jolly Grant helipad. 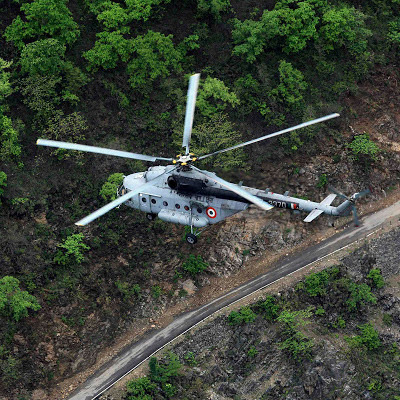 The next morning, around 9am, he was off to Kedarnath in his Mi-17 V5 chopper, IAF's newest and most powerful acquisition with a carrying capacity of 3 tonnes. The first batch of 20 people was evacuated to Guptkashi. From there, they made their way to Dehradun. Yunus reckons he might have flown about 500 people in innumerable sorties to safety. He is still at it. "I was told to rescue people from the more isolated Harsil sector, ahead of Uttarkashi, and in a restricted helipad at about 6000 ft."
Bad weather and poor visibility made things difficult. Add to that the terrain and Yunus' job was cut out. 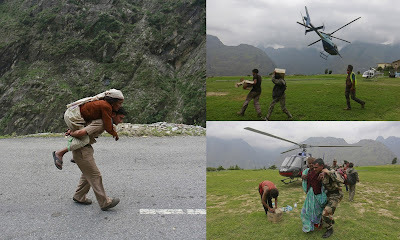 "When we landed at Kedarnath, roughly 9,600ft, the helipad had been washed away. We had to rescue people from the ridge" . The sorties continued. On receiving information, Capt. Febha Susan, Lady Doctor of Army walked 15 Km to reach two pregnant ladies. You are our guiding beacon: Air Force tribute to officers who died in Uttarakhand chopper crash, bad weather 'won't stop' us helping flood victims in Uttarakhand . Air chief NAK Browne said, "Rotors won't stop, we owe it to our men who died. 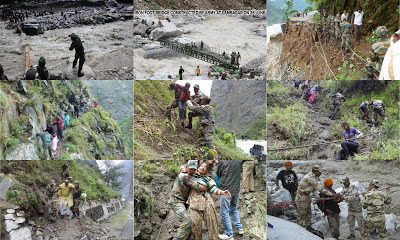 NDRF, ITBP and our men have done an outstanding job." 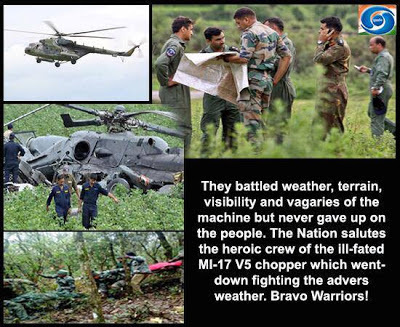 After 20 soldiers, rescuers and para-military officers died when their helicopter crashed while on a rescue mission in Uttarakhand, the Indian Air Force offered a moving tribute. It is signed "Brothers in Arms and the IAF family." A postscript says - "We will rest, but only after the rescue mission." With 60 helicopters in service, the mission to rescue thousands of people stranded in the flash floods in Uttarakhand is the air force's largest effort of this nature. The rescue operation is not without hazards of its own. Pilots say the difficult terrain, adverse winds and absence of landing pads are testing their will and courage. "It is a warlike situation for us," said one pilot, Captain Sandeep Soti. "We have been pushing our men and our machines beyond our capacities." The paramilitary men on the Mi-17 had been building helipads, helping stranded people and digging bodies from the debris in the submerged town of Kedarnath for the past week. "These boys were among the first to land at Kedarnath to help pilgrims," said Deepak Pandey, a spokesman for one of the groups, the Indo-Tibetan Border Police. "They were coming home now." A pilot noticed around 100 people on the steep, forested upper slope of a hill, he said. Below, a river was overflowing. There was no landing place. The pilot negotiated the narrow valley and dropped four soldiers of special forces on the upper slope. spell bound!! 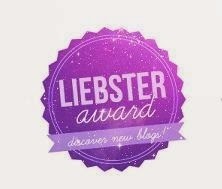 very nice post ! !